"I can't play an AVI movie with my QuickTime player and I get an error message 'Mac OS error – 50' when I try to play it. I have just updated QuickTime to the latest version. Should I get a 2019 new AVI player Mac or convert AVI to QuickTime MP4, MOV, etc?" In fact, to solve the problem of how to play AVI on Mac OS X, you should figure out what is AVI and why QuickTime won't play AVI videos encoded with DivX, XviD, WMV and other video codecs on Mac at first. As is known to all, AVI is a multimedia container format which contains both audio and video data and QuickTime can only play AVI file with Motion JPEG video. Though users can install Perian to make QuickTime support more AVI files, the older plugins no longer work with the latest Mac operating systems like El Capitan, macOS Sierra or macOS Mojave. Thus, to effortlessly play AVI videos, movies and more on Mac, you should find out the best AVI player for Mac in 2019. 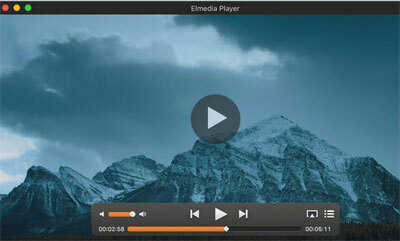 In the part below, we list top useful Mac AVI media players for your consideration. To easily play AVI video/movie files on Mac, you can free download the best AVI converter for Mac - MacX Video Converter Pro to convert AVI of any video audio codec to MP4, MOV, MKV, FLV, etc for free playback on QuickTime or other video players Mac. As one of 2019's most user-friendly free AVI files players for Mac, 5KPlayer provides users a convenient way to play any AVI video files at any video quality including 720P/1080P HD, 4K UHD and more on macOS. To be specific, it supports replaying all AVI audio video codecs like DivX, XVID, Cinepak, Indeo, DV, MJPEG codec, etc. 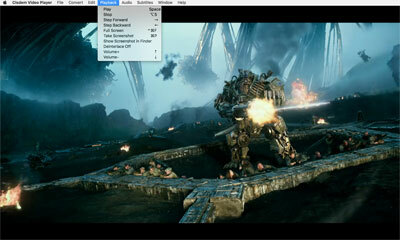 In addition to AVI, it is also able to play MKV, MP4, WMV, MOV, FLV and other video formats on Mac computer. BTW, 5KPlayer enables users to free download online videos, movies, TV shows and more from online 300+ sites in AVI, MKV, MOV, 3D, 720P, 1080P, 4K UHD, etc. Feel free to free download 5KPlayer for playing AVI files on Mac without any limits. Elmedia is a multiformat free AVI player for Mac in 2019 which supports any file format, for example, AVI, FLV, MP4, MOV, DAT, MKV, MP3, FLAC, M4V, etc. Of course, this program has some bonus features that you may be interested in, for instance, flip video image vertically, rotate, mirror, adjust color/brightness/contrast/volume, set language/font/size/color, import subtitles, etc. 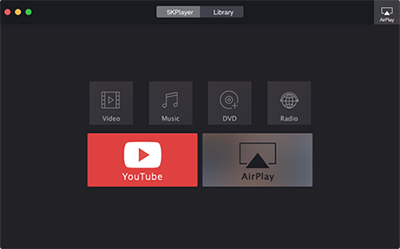 But, comparing with other functional video players for Mac OS X, the only drawback of this AVI Mac player is that it is not available for free. Beyond doubt, VLC Media Player is one of 2019 best free AVI players Mac which is compatible with almost every Mac device. 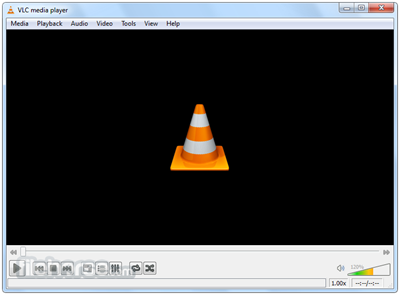 This open-source AVI video player is able to play AVI, MP4, MP3, WMV and many other popular video/audio files as well as DVDs, Audio CDs and VCDs on Mac computers. And it allows users to embed subtitles into the video file. What's more, this AVI VLC media player for Mac is available for Windows, Mac, Android, etc and doesn't contain any ads or malware. But, sometimes, you may also come across some problems when playing AVI videos in VLC, like VLC video audio out of sync, VLC subtitles delay in video playback, etc. Cisdem Video Player for Mac is also a free AVI video player for Mac 2019 which supports for replaying any AVI files in 4K, 5K and full HD 1080P without any issue of buffering crashed while playing. Certainly, it also supports playing other popular video formats on Mac including MKV, FLV, MP3, MTS, 3GP, AVCHD, WMV and other 50+ formats. And it also has many welcomed features like full-screen playback, volume control, fast-forward button, fast-backward button, Last button, Subtitle selecting button, deinterlace and more. 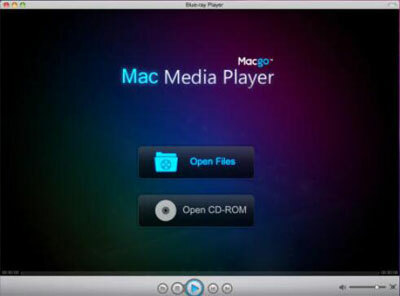 Macgo Mac Media Player is a totally free media player for macOS which is capable of replaying DVD, VideoCD, AVI, MKV, MOV, FLV, WMV, MP4, MP3, WMA and other formats on Mac computer in high quality. And this free AVI video player for Mac fully supports to embed subtitles and allow users to search for the videos and play directly. But, it doesn't support 4K UHD video playback so that you have to look for other reliable free media players for Mac in order to enjoy 4K/8K UHD video. Truly, although the aforementioned 2019 AVI players Mac are all worthy of downloading, 4K or 8K UHD AVI video still won't play on VLC and Macgo Mac Media Player. And, there are many other factors will make users desperated of various choices, like too many ads, useless plugins, virus, etc. Here, we introduce you an ultimate way to play AVI files on MacBook Pro/Air/iMac. As previously described, QuickTime only can play AVI files encoded with Motion JPEG and users have to install Perian component to play AVI videos/movies encoded with DivX, XviD, WMV and other video codecs. Actually, you can directly convert AVI to QuickTime supported video/audio formats with the help of video converter for playback with ease. Serving as a professional AVI converter for Mac, MacX Video Converter Pro can easily convert AVI of any video audio codec to QuickTime MOV, MP4, M4V, MP3, AIFF, M4A and other supported format or codec on macOS with no quality loss and world's fastest speed. Better still, this AVI video converter also can convert other video/audio formats like WMV, MKV, VOB, FLV, MXF, AVCHD, 3GP, FLAC, OGG, WMA and more to QuickTime supported formats or convert AVI to iPhone iPad iPod Android for playback on the move. Later, you can freely play AVI files on QuickTime or other AVI players Mac. Please download this Mac AVI converter on your macOS (macOS Mojave included). Then follow the below guide to begin the task of AVI conversion. Step 1: Launch this AVI video converter for Mac and click "+ video" icon to load AVI file you want to convert. Alternatively, you can directly drag & drop it to the main interface. Suprisingly, batch conversion is supported. 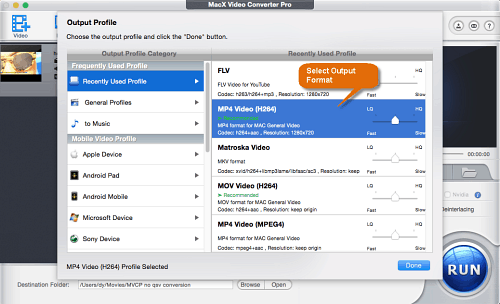 Step 2: Select MOV or MP4 as the output video format in the Output Profile window. BTW, this AVI file converter for Mac can also aid you to convert AVI to WMV, AVI to iMovie, AVI to iPhone XS/XR/7/6S/SE, AVI to 3GP, etc. Step 3: Click "Browse" button to specify a destination folder to save the converted AVI file and hit "RUN" button to start converting AVI to MP4, AVI to MOV, AVI to M4V and more. After converting, you can play the converted video file on QuickTime or other media players Mac. Topmost AVI video converter - MacX Video Converter Pro is able to convert AVI to Mac supported video formats like MOV, MP4, etc with world's fastest speed and zero quality loss for free playback on QuickTime, VLC and more.